Plastic Warzone Bauhaus Ducal Militia figures painted as a multi-use opposition/alternate force for sci-fi skirmishes. 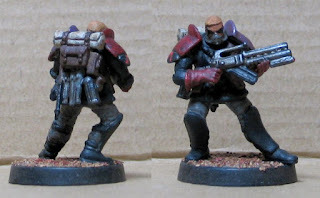 All but the bare-headed one were painted years and years ago when the Warzone boxed set came out. And then Warzone died and they were not joined by any of their brethren to make a larger force. That's going to change sometime soon and it starts now. Then came the Cinco de Mayo plastics explosion blogpost LINK, and this guy was assembled as a hero/leader. And now he's painted, bringing new life to the whole "Kabal Project." Since he was getting painted I thought it would be good to repaint/fix the earlier troopers so that they'd fit in together with their new leader. 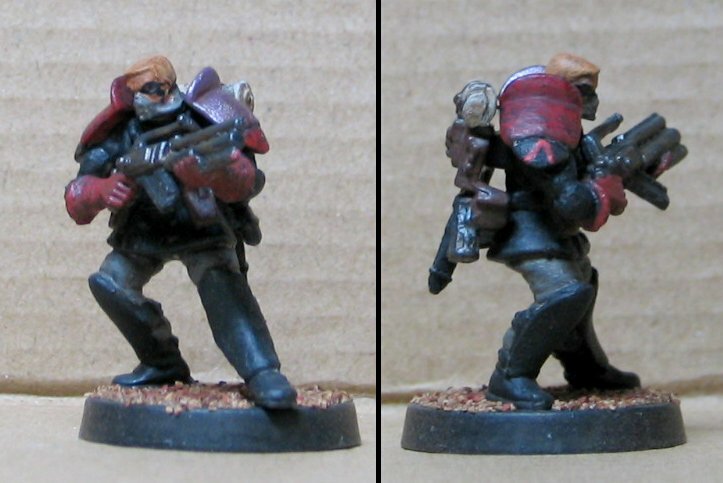 Shoulder pads and squad markings were redone. The gasmasks were redone and some of the pouches and packs were gussied up as well. There's a rough plan for the Kabal to grow to include a larger "Wing" of these guys with some Void Commandos as scouts/commandos and some other Void and Warzone minis as more elite troops.